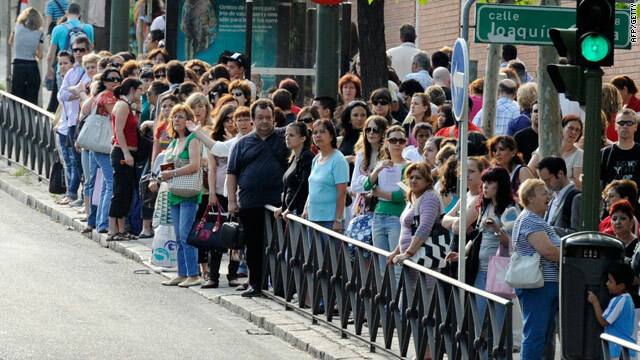 Long queues for a bus: Commuters in Madrid struggled on Tuesday as a labor strike shut down the Spanish capital's subway. Madrid, Spain -- Chaos reigned in Madrid Tuesday as a strike shut down the Spanish capital's metro system, forcing roughly 2.5 million riders to fill buses and taxis, reported CNN's sister network CNN Plus. Employees of the underground railway are striking to protest the central government's austerity plan that includes an average 5 percent pay cut in salaries. It was the second day of strikes in Madrid, the workers' union said. A third walkout is planned for Wednesday, without providing the minimum service that is required by Spanish law. A spokesman for the Ministry of Transport told the state news agency EFE that bus and commuter train service would be beefed up to help alleviate the travel shortages.